RETURN TO YOUR ACTIVE LIFESTYLE! Our mission is to provide each patient with the highest quality, individualized care in a comfortable and caring environment. We are trusted and receive referrals from leading physicians in our local community as well as from top physicians from around the state and country. From manual therapy, neurological rehabilitation, orthopedics, occupational therapy, pain management, pre- and post-operative rehabilitation, sports medicine, and work/industry rehab services, we at Professional Care Physical Therapy and Rehabilitation are committed to the health and wellness of our patients and continue to be recognized as leaders in the field of Physical Therapy. 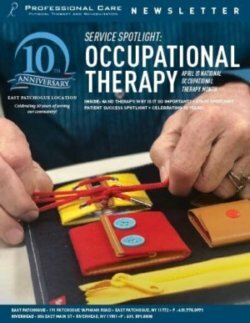 Read our latest newsletter and learn more about our Occupational Therapy Services! Dr. Natalie Niemczyk is now a Certified Strength and Conditioning Specialist! Congratulations to Dr. Natalie Niemczyk for receiving her latest certification and becoming a Certified Strength and Conditioning Specialist! Learn More about Dr. Natalie! The ProCare Team is back at work with the Pat-Med JV and Varsity Players for another season! Click to see the RAIDERS in action! Meet our Occupational Therapist and Certified Hand Therapist! We are excited to announce that Occupational Therapist and Certified Hand Specialist, Ms. Amanda Loevner, has officially joined our team! Learn More about Amanda Loevner! Our East Patchogue Office Location Has Moved! We are thrilled to announce that on Monday, January 28th at 7:00 am, the doors to our BRAND NEW 7,000 sqft facility have opened for our patients! Please come visit us at our new East Patchogue location, 191 Patchogue-Yaphank Road! Click to see the team in action! ProCare is a truly amazing place with a very caring and compassionate staff. George and his team skillfully motivate their patients and inspire them to do their best through encouragement and kindness. George is exceptionally knowledgeable, and the entire staff REALLY cares about how the patients are progressing. Several years ago, after breaking two femurs, I experienced the wonderful work which ProCare accomplishes. I arrived in a wheelchair and am now back to walking as I did before my injuries. I highly recommend ProCare! In addition, George and his associates are actively involved in a variety of programs and activities to enhance our local community. It is my pleasure to recommend George and staff!! Professional Care Physical Therapy is amazing. I was a patient for multiple issues, and every time I went, I was treated professionally, and with compassion. George Ciresi was my primary PT, and I could not have asked for anyone better. All of my concerns were always addressed, and I never felt rushed. Jim Blair also treated me, and I always appreciated the therapy I received. The entire staff is awesome, from the front desk to the assistants and aides. I have recommended this group to many, who have also been very satisfied. Personalized therapy services with personal attention! Tom and the staff have been awesome to both of my children. Tom was able to get my daughter back on the court stronger then she was before her injury. Tom is now working to get my son back on the field after his ACL surgery. I can’t say enough about how friendly the staff is and always make you feel welcome when you walk in the door. I started physical therapy in March 2018 after having my left knee replaced on January 29. I was lucky enough to have Darek in charge of my therapy. It has been a long road, not an easy recovery, but I’m so glad this is the place I decided to come to. Everyone here treats their patients with the utmost respect, and that goes a long way. From the moment you walk in the door, you are greeted by name from anyone who sees you. As for Darek, he is a very professional caring man, who really gets to know his patients. And when you’re going for 3 months, you develop a relationship with people that makes it easier to go to the place where sometimes it’s not always fun. I wholeheartedly would recommend this practice to anyone who is in need of therapy. I have been going to Professional Care PT for over 5 months! I’ve gone to a few other therapists, but must say that my experience at Prof. Care has been the best, by far! I suffer from pain in my neck, shoulders, spine, hips, knees, and fibromyalgia! Dan, my personal PT, has been treating me all along, and I must say that he always goes Above and Beyond and I highly recommend him to anyone suffering from ANY type of disability or pain issues. Love the 2 Erin’s’, Will, Nick, and ALL the amazing pt assistants and must say that their quick attention to my various needs is much appreciated! I am grateful to EVERY employee for making me feel comfortable and enabling me to get the best treatment possible at each visit! Thanks to ALL and May God Bless You for your gift of helping those with various disabling issues! If there were more than five stars I would give them because they are deserved. Everyone who works here is caring, professional, and helpful. Jim and the staff have gotten me through more than one rehab stint with great success. After a knee replacement, I could not drive and had to go someplace closer to my home. BIG Mistake! The care and treatment was no way near adequate and recovery was not a good experience. Once I could drive and came back to Procare what a difference! I will never again make the mistake of not coming here. Jim also treated my son when he injured his ankle. Another success. I highly recommend Procare for all physical therapy needs. HELPFUL TIPS JUST FOR YOU! Sign up now to get healthy tips delivered straight to your inbox!